This energetic little bird is often seen climbing down trees headfirst. It eats bark insects, seeds and nuts. It is a frequenter of bird feeders in the winter here in the Northeast, especially attracted by sunflower seeds and suet. 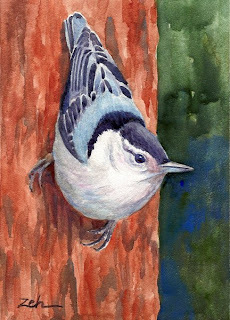 The nuthatch makes a home in woodlands, river trees, forests and shade trees.